We always have a big garden. We always end up with more produce than we can use, and we end up freezing, canning, and giving a lot away. This year, we went even bigger! We planted 1/10 of an acre of sweet corn. That’s right, I said a tenth of an acre. That’s 4356 square feet, or a little less than the space between two 10-yard lines on a football field. Yeah, it’s a lot of sweet corn. So this year we made our already big garden even bigger. 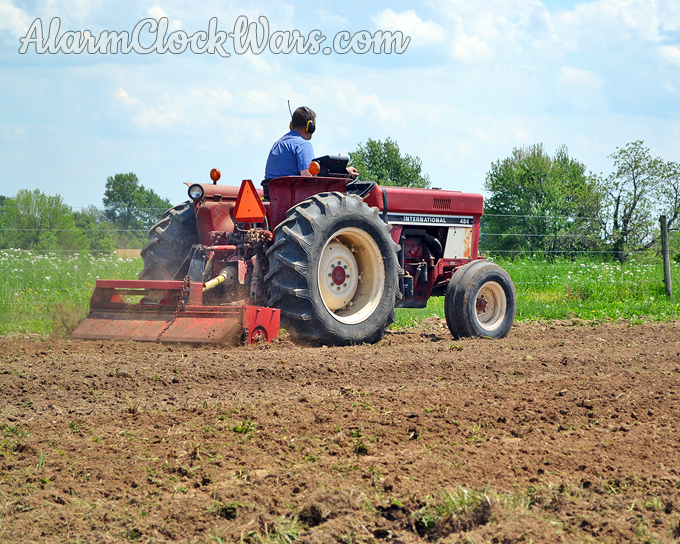 Farmer Doc got out his tractor and tilled everything up really well to get the soil prepared. 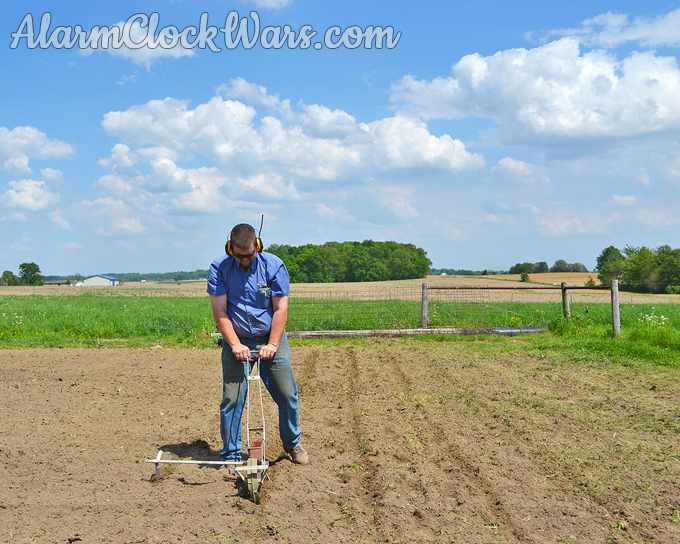 Once the ground was ready, he used his one-row planter to plant the sweet corn. The planter digs a trench, drops seed into it, and then covers it back up. At the same time, the marker tells Farmer Doc where the next row should be planted. It’s a little less elegant than the big corn planters, but it gets the job done. Then we got the rest of the garden ready and some seeds planted. After I took this picture, we put in 19 tomato plants. Yes. 19 tomato plants. We will be making lots of tomato juice this fall! Then we waited for the corn to come up. And the weeds came up with the corn. We didn’t start out with the best soil in our garden. There was a lot of clay, and it was very tightly packed. Farmer Doc has been working for years to mix in composted cow manure and to get the soil broken up. 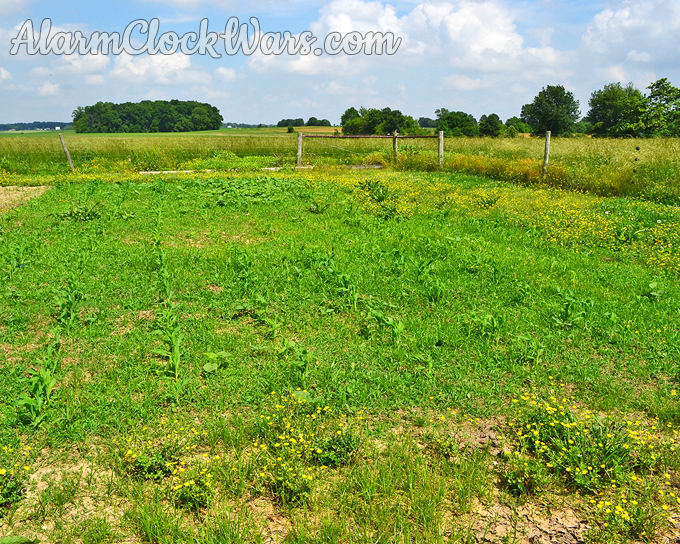 One of the downfalls of using cow manure for fertilizer is that it grows a lot of weeds. And I mean a lot. Seriously… can you even tell where the corn is in the middle of all these weeds? One of the best things about this hybrid of sweet corn is that it was genetically modified to be resistant to Round Up. So we were able to spray weed killer on the corn, kill the weeds, and allow the corn to grow. This is the same section of garden, 12 days later. The weeds are gone! And the corn is growing so well! 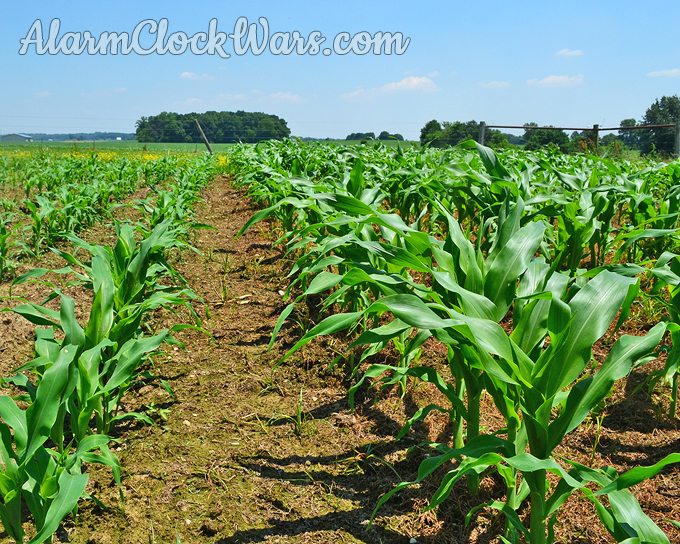 As the corn grows, the leaves form a canopy. The canopy shades the ground between the plants, so no more weeds can grow. This has saved us so much time and energy! If we left those weeds alone, they would have overpowered the corn and we wouldn’t have any. It would have taken us hours and hours of time, and lots of work with our gas-powered tiller and on our hands and knees to get the weeds under control without using weed killer. 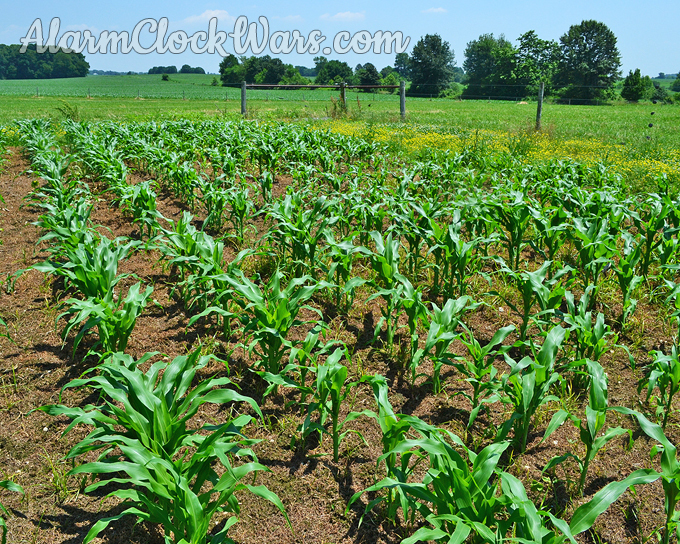 Because we planted so much sweet corn, we didn’t want to plant it all at the same time. 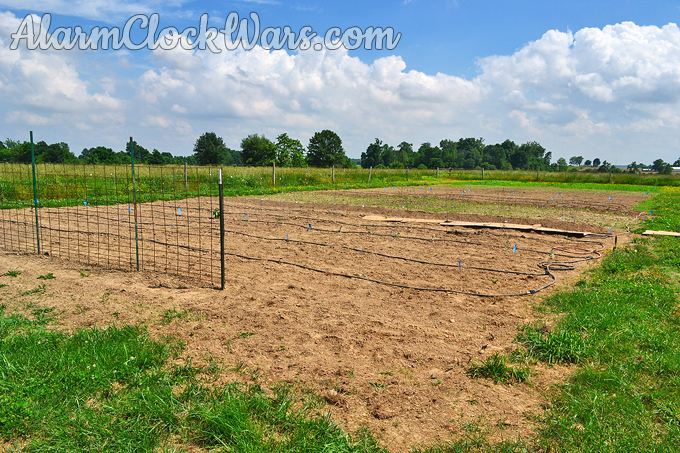 We planted at four different times, about 7-10 days between each planting. The first planting is on the right of the photo below, and the second planting is on the left. 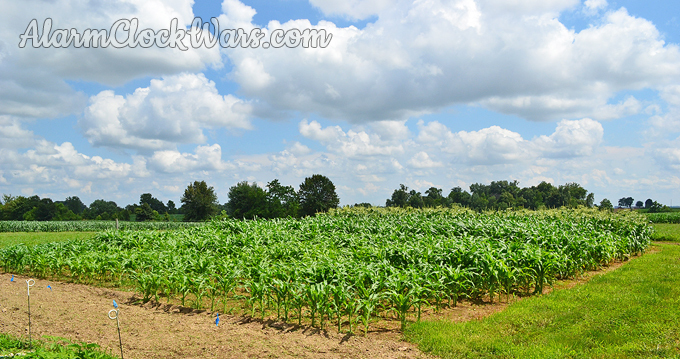 Here are all four plantings of our corn. The newest plants are in the front, and the oldest plants are in the back. The first planting (in the back) has put on tassels, while the fourth planting (in the front) still has a long way to go to get to that stage. Just look at those beautiful tassels! This tassel is chock full of corn pollen, and is needed for the ears to develop. And look, a little baby ear of corn! 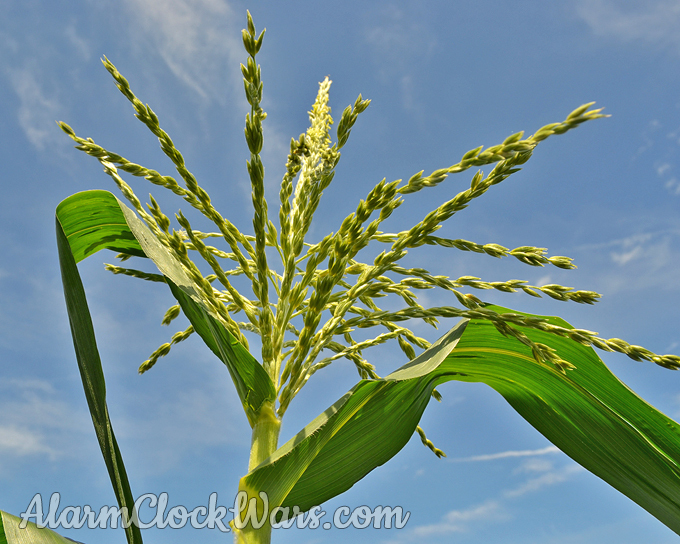 Those silks coming off the top catch the pollen from the tassel so the corn kernels can develop. 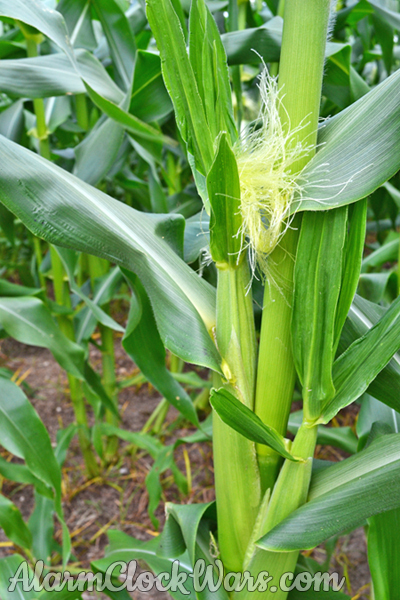 Our first sweet corn should be ready to eat at the end of July, and we are really looking forward to it! What is your favorite summer time vegetable? Do you grow it yourself, or do you find it at a farmer’s market or a grocery store? 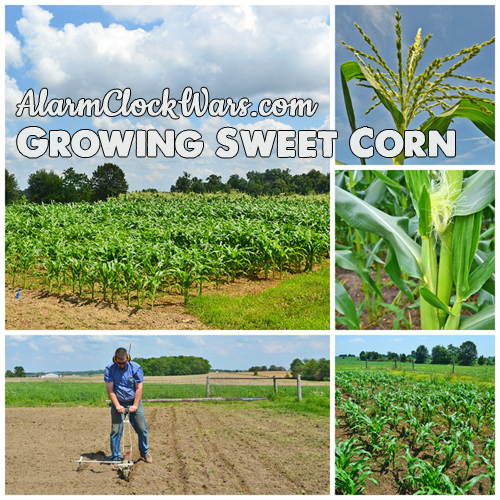 We cook a lot of sweet corn here over the summer, and we freeze even more! Here are the tools I use with our sweet corn all summer long. Wow. Those weeds really had shot up! Was that land you hadn’t put a garden on before? Just wondering how much grass will keep coming! We have gardened this plot for a few years already! It was pretty rough soil to begin with, so every year Farmer Doc spreads more composted cow manure on it. That’s a big part of why we get so many weeds – so fast. We had our pumpkins and gourds in this part last year, and a lot of the “weeds” in the back part of the photo are actually volunteer gourd plants that sprang up! The corn is tall enough now that we aren’t worried about weeds/grass there anymore. Our green beans are another story, though! corn is my favorite veggie and i either get it from a farmers market or the store. we have not had much luck the last couple years growing it so decided not to this year. seems we feed more raccoons and deer before we get it harvested. I’m beginning to like vine tomatoes also and good green beans. have you ever grown butter beans? your corn is looking good.